Professor Layton and Pandora's Box dated for Europe. We’ve just got word from Nintendo Europe that their DS puzzle fest Professor Layton and Pandora's Box will launch on 25th September in Europe. Predictably our friends in North America will get the game slightly earlier on the 24th August where it will be known as Professor Layton and the Diabolical Box instead just to confuse everybody! The game is of course a follow-up to the excellent Professor Layton and the Curious Village which came out last year. It’s been out in Japan for about 2 years now, so it’s good to see that Nintendo’s translation team have finally wrapped this one up. The game follows Professor Layton and Luke travelling cross country by train to solve the mystery behind a strange box that is said to kill anyone who opens it. There are over 150 new puzzles and riddles on offer, including additional content which will be available for download using the Wi-Fi Connection. Watch out for the full Nintendo Life review once we get our grubby mitts on this puzzling wonder. Same day as Scribblenauts, no less. Fantastic, I've got to find £60 by September, and that';s just for DS games alone. I need to complete Curious Village before September then. Why do we get a weird title? Hooray!!! I just can't wait for this game to come out! I need to get the first one (which I once borrowed.) And of course America is the only place that there's a name change. i've been waiting for this game! and i love the first Layton game! 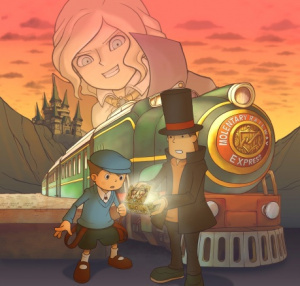 but i heared japan had another layton sequel "the last time travel?" Anyway, I can't wait to get this game. I played the first one through Gamefly, and I'm just going to buy the second one. If it's like the first one, I'll be happy for quite some time.